I adopted a Boxer puppy several years ago as a family pet. We had 2 young girls at the time of acquiring our new puppy that we named Sophy. 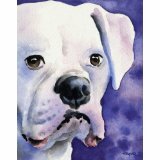 Sophy happened to be a white Boxer. She was the cutest thing I'd ever seen in my life! I took her to the vet's office to make sure she had all her necessary shots etc... The vet reluctantly advised me that I should have Sophy put to sleep, saying that white boxers usually ended up with problems such as loss of vision and tumors. My heart broke at hearing this, but I took no time in deciding that no matter what I was keeping my puppy. I walked out. When she was 6 months old, I took her through obedience training. I worked with her and trained her. She learned quickly and was very intelligent. She loved the girls and put up with what ever they wanted.....dressing her, painting her toe nails, riding her. The whole neighborhood fell in love with Sophy. One winter morning after letting her out in our fenced in back yard, I found she was gone when I called her to come in. She had slipped through the gate and decided to explore other territories. My husband and I each left separately scouring the neighborhood and beyond to find Sophy. We came back empty handed. Our hearts were torn in two. I informed my family of the loss. When my brother got word of it he immediately left to search for Sophy without our knowing it. He had adopted Sophy's sister, Booger. Soon I noticed someone coming up our front porch through the window on the door. I soon discovered it was my brother holding a white boxer. My heart leaped, but only for a second, soon believing it was probably Booger in his arms. But to my excitement I saw it was my Sophy once I opened the door! He searched for her and eventually followed some paw prints in the snow he had seen which led him to a cold little boxer under a neighbor's porch. I could tell so much more about Sophy. She brought everyone such joy for years. The vet had predicted she would live a very short life, but Sophy lived for nine years after. The day came where the tough decision of having to put her to rest was made. My girls, teenagers now, drove Sophy to the very same vet that predicted her short life. He said, the reason our boxer had lived such a long healthy life, was because of all the care and love we gave her. We had Sophy cremated. This is the kind of dog story I love to read. Kyle, you truly gave Sophy a wonderful life by going against the odds and ignoring the vet's advice. And, it appears Sophy knew this and gave back a lot to you and your family in return. What a happy outcome.